One of Ireland’s best-known travel writers and broadcasters has joined Cumbria Tourism, to head up a major project helping attract international visitors to World Heritage Sites across the North of England. As part of the UK Government’s £40 million Discover England Fund, Tourism Minister Michael Ellis confirmed exciting new plans for Cumbria Tourism to lead the ‘Northern World Heritage Collection’ earlier this summer. The new £250,000 project will tell the story of England’s culture and heritage through the North’s outstanding UNESCO World Heritage Sites and will enable Cumbrian businesses to better target both groups and independent travellers from the USA and Ireland. So, it’s fitting that Irishman Fionn Davenport has been appointed to take on the role. Most recently Fionn has worked on two other Discover England Fund projects; one in conjunction with Marketing Manchester and a second targeting American visitors in the South of England. 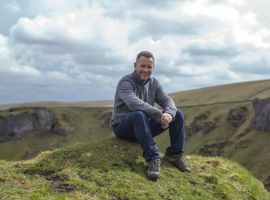 As an experienced Lonely Planet writer, as well as a regular presence in the travel pages of Irish newspapers, he has a wealth of experience in travel journalism and has written guidebooks inspiring people to explore multiple destinations – from his native country to Vietnam. He’s also been a regular fixture on Ireland’s RTE Radio 1, sharing travel advice with the national radio station’s 1.4 million listeners. Fionn’s latest role at Cumbria Tourism will involve working with fellow Northern World Heritage sites such as Liverpool and Durham, surrounding businesses and other tourism bodies over the next 6 months to help attract and welcome American and Irish visitors. Activity will include business and itinerary development, training and trade shows, alongside marketing, online content, film and PR. It will also involve working alongside tour operators and agents to help visitors book their trips to multiple World Heritage sites across the North quickly and easily.